Rimmers Music | BlogBuyers GuidesBuyers Guides - Piano & KeyboardDifferences Between Yamaha YDP Arius And Yamaha CLP Clavinova Digital Pianos Explained. Differences Between Yamaha YDP Arius And Yamaha CLP Clavinova Digital Pianos Explained. Here we explain the differences between the Yamaha YDP range (Arius) and Yamaha CLP (Clavinova) range of digital pianos. With the huge range of digital cabinet pianos out there, it can often be intimidating trying to find the right piano for you. This blog will hopefully highlight the differences between Yamaha’s digital cabinet pianos and make the process of finding your perfect piano much easier. We fully explain the Yamaha YDP Arius range of pianos and the Yamaha CLP Clavinova range of products in detail with text, images and video demonstrations. Yamaha’s cabinet digital pianos begin with the YDP series. Also known as Yamaha Arius. Often we are asked, what does the “YDP” mean? The YDP stands for “Yamaha Digital Piano” and these are the entry level of digital pianos that Yamaha make for the home market. This series includes four models; Yamaha YDP-S34, YDP-S54, Yamaha YDP-144 and YDP-164. The “S” in the model number stands for “slim”. These models are designed to be as space saving as possible. The Yamaha YDPS34 features a Graded Hammer Standard (GHS) Keyboard, meaning that the keys get progressively lighter in sections as you move up the keyboard. It has 10 voices, including the fantastic Yamaha CFX concert grand and 192 note polyphony. Polyphony is the amount of notes that can be played at the same time. You may think that you only have 10 fingers (or most people do), what’s the benefit? You need a large polyphony to ensure you get a great sound. For example, if you hold the “sustain” pedal down this allows more notes to be played simultaneously, ie the last notes you play continue to play until the sound fades away, or you release the pedal. Also, in order to ensure a great sound some sounds use more that one note allowance of polyphony and if you play two sounds at the same time this doubles up the notes used from a polyphony point of view. In addition, modern technology allow digital pianos to be played using “MIDI FILES”. These are pre-recorded data that use note data on different tracks for different sounds (I hope I am explaining this ok). So the more polyphony the piano has the better it will ultimately be! The Yamaha YDP144 includes the same specifications as the Yamaha YDPS34, but a slightly larger cabinet and sliding key cover rather than folding. Moving up the series, the Yamaha YDPS54 and Yamaha YDP164 feature an improved touch called GH3 with synthetic ebony and white keytops. These keys give you a better grip on the key, which is better than the pure plastic keys on many electric pianos. The GH3 keyboard has 3 sensors in each key, providing a more responsive touch and the synthetic keys allow for long practice without slippage. These two models also have improved amplification, featuring 20W x2 amplifiers compared to the 8W x2 on the Yamaha YDPS-34 and Yamaha YDP-144. Much like the previous two models, the only difference between the Yamaha YDPS-54 and Yamaha YDP-164 is the larger cabinet and sliding key cover. After the Yamaha Arius series, we move onto the Yamaha Clavinova range, more specifically the CLP range. This range consists of 7 pianos; 5 upright digital pianos and 2 digital grand pianos. Much like the Arius range, every piano in this series features the Yamaha CFX Grand piano sound, but in addition to this, the Yamaha CLP Clavinova range feature the Bösendorfer Imperial. This is another fantastic concert grand piano sound for you to use. The Bösendorfer sound, although still very powerful, is slightly mellower and perfect for Romantic music such as Debussy and Chopin. For the first time, Clavinovas now include binaural sampling of the CFX. With the process of using specialized microphones to record locational material, the experience of playing the CFX with headphones on is now so real, you’ll forget that you are even wearing them! The Yamaha Clavinova 600 series begins with the fantastic Yamaha CLP625. 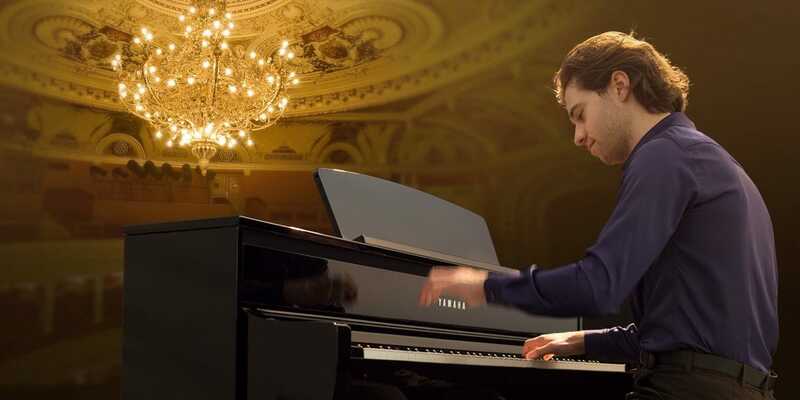 Along with the CFX and Bösendorfer, it features 8 other voices which can be changed using the function button in conjunction with keys on the piano. It boasts a Graded Hammer 3 X Action which is an upgrade from the GH3 keyboard in the Arius range, meaning that the feel is even closer to that of an acoustic piano. The Yamaha CLP635 Clavinova is the first in the series with an intuitive display, with all the features being controlled from a small, easy-to-use screen to the left of the keyboard. It also includes the Piano Room feature, which allows the player to control details such as lid position, resonance and tuning. The Clavinova CLP-635 also boasts advanced sampling called Virtual Resonance Modelling (VRM). This fantastic technology takes into account the resonances that would happen when playing an acoustic piano and recreates them digitally. The number of voices has increased from 10 up to 36 in this model and more colour options are available including the stunning White Ash and Dark Walnut. The Yamaha CLP-645 is the first in the series to feature a Natural Wood X Keyboard. Much like in their grand pianos, the wood that Yamaha use to create these keys is dried specifically for use in musical instruments. The keyboard is graded in sections like the previous models, and the addition of the wooden keys creates a more responsive touch closer to that of a real piano. The VRM is also more advanced in this model, with the ability to calculate the resonance of two strings per note. 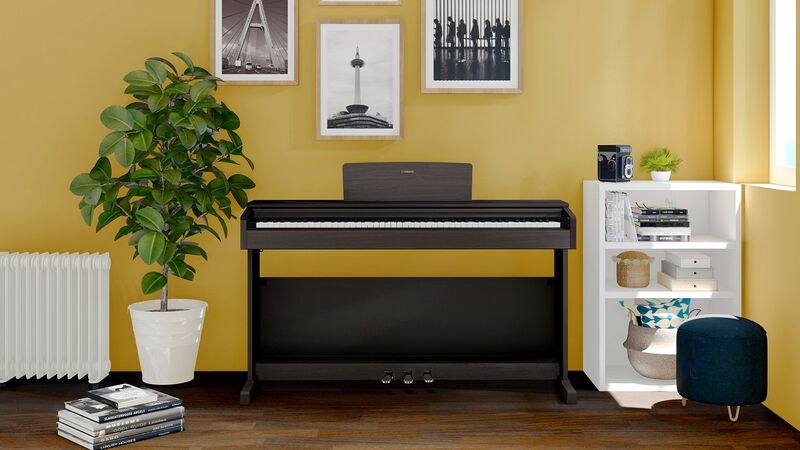 The Yamaha Clavinova CLP645 features Bluetooth connectivity, meaning that you are able to connect your device, providing the ability to play audio through the piano or use it in conjunction with a variety of apps. The Yamaha CLP-675 features the brilliant new GrandTouch keyboard. This has linear graded hammers, with every single key getting slightly lighter as you move up the keyboard. Another way in which they have recreated the feel of playing a Grand Piano is through the addition of the GP Response Damper Pedal. If you think of the damper pedal on the previous models as a light switch, the GP Response pedal acts more like a dimmer switch, allowing half-pedalling and a more responsive experience overall. The very top of the Yamaha Clavinova CLP upright range is the Yamaha CLP-685. The touch of this piano is incredible. Again, it features the GrandTouch keyboard, with the addition of counterweights on every key, making the experience as close as possible to playing a grand piano. Not only are the speakers in the Yamaha CLP685 Clavinova more powerful than the previous models, creating a fuller sound than any others in the series, they are also made from the same spruce that Yamaha use for the soundboards of acoustics. This attention to detail is what makes Clavinovas stand out among other models. The design of the Yamaha CLP685 is based on that of the Yamaha B2 acoustic upright, so not only is the sound and feel incredibly close to a real piano, but the appearance is also. The Yamaha CLP 600 series includes two other models; the CLP-665GP and the new CLP-695GP. The Yamaha CLP-665GP has mostly the same features as the Yamaha CLP-635, the main differences being the grand piano casing and slightly more powerful speakers. Similarly, the Yamaha CLP695GP has all the features of the Yamaha CLP685 but with the appearance of a baby grand piano and also the addition of a twisted flare port, providing a more focused bass sound. I hope you have found our blog information and enjoyed watching the videos.